some friends at a BBQ in Christchurch enthusiastically told us about an adventure they had had there. The idea of remoteness, rough roads and challenging river crossings, plus occasional amazing hotpools definitely appealed to us. So finally we decided that this year, in late July, we would go there. We only had two weeks because after that Chris needed to get to France to get in some last minute training before WOC, but we decided this was enough time for a good adventure. I did a bit of reading and soon discovered that a circumnavigation of the Island via the busy and very touristy ring road was probably not for us. The interior of Iceland however, with its challenging roads and remoteness sounded more like it. We flew into Keflavik on July 17 with most of our gear sorted, but a few last minute things needed sorting – such as a new spoke on Chris’s rear wheel and a brake ‘bleed’ for my bike. We had decided to take our full suspension mountain bikes and had bought some expensive ‘Old Man Mountain’ carriers especially for the full suspension bikes which we hoped would do the trick. The landscape of Iceland is entirely unique and as I gazed out the plane window I saw a barren rocky lava field, no trees in sight, but patches of brilliant green grasses dotted here and there. We camped the night at a campground only 2 km from the airport – after arriving in the evening light at 3 am. A morning spent fiddling on the bikes and buying a few bits in the fairly bleak and windy town of Keflavik and we decided our first destination was the touristy but very nice sounding Blue Lagoon commercial hotsprings. On the way there we befriended a Swedish man who had just spent one month cycle touring on the island, he gave us lots of helpful advice, and gave us a mosquito face net – we would later find this invaluable! The pools were wonderful, an amazing shade of silvery blue with this strange silicon mud you could spread on your face for beautifying oneself – not sure about that – but we soaked in the pools until we were prunes, then we cycled a bit further down the road to a rare patch of pine trees which bordered the lumpy lava flow. There we found a grassy spot for our tent, and cooked up a feast. A group of Icelanders with a big dog wandered past – noticeable by there very distinctive knitted sweaters that we were coming to realise all Icelanders wear, big or small. We were really excited about exploring this unique land and being self sufficient on bikes seemed like such a great way to do this. We had bought numerous maps, along with the ‘Hot pools of Iceland’ book, so we had already formulated some rough plans of where we wanted to ride. We discovered it was good we had come over so late because many of the roads we planned to ride did not open until late July because of snow melt and high rivers. Our plan for the first day was to ride most of the way around the Reykjanes peninsula towards Selfoss visiting some sea cliffs along the way where there was a very small chance of seeing puffins. The roads became unsealed and rougher as we made our way round the peninsula and occasionally we could see ‘steam pots’ in the distance. Cool woolly sheep - we should have some more colourful varieties like this in NZ! It was sunny, but also very cool and windy, and it became progressively windier as we made our way out to the bird colonies on the sea cliffs. We saw some amazing woolly sheep along the way. 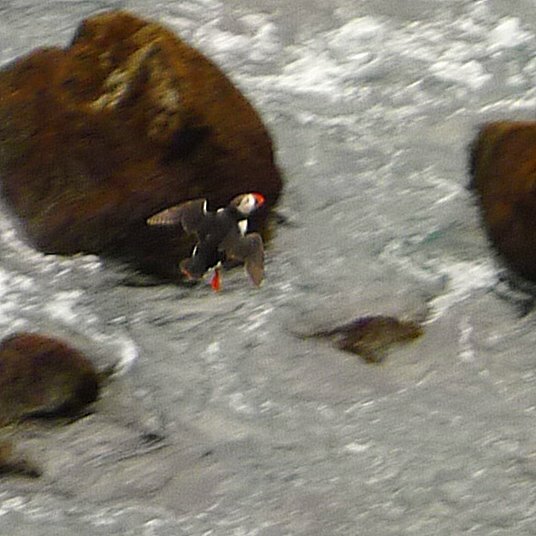 We were sitting on the cliff edge eating sandwiches and watching thousands of seabirds – mostly some kind of seagull thing – swooping and diving, when suddenly Chris jumped up and nearly dropped his sandwich off the cliff, he was certain he had seen a puffin! The next hour was spent scanning the cliffs catching better and better glimpses of puffins, their distinctive little red beaks and feet shining up as us. After some detailed observing we noticed three puffins landing on a ledge that we could possibly peer down to, so we ran over to the edge and peered and there, sure enough, were 3 little puffins all in a row about 10 metres below us. We were so lucky to see them so close up, about two minutes later they flew off again. After our excitement at the bird colony we continued along the coast until we started to get a bit tired, and we happened upon a sign which read ‘Free Camping’; we turned down to the beach and found a nice mowed lawn with little tables and a clean toilet area, what a great find! It was still cold and windy, so we put on our down jackets and went for a stroll to an old church. There were some beautiful wild horses and strangely coloured sheep in the paddock alongside our free camping. We also discovered a basket of fresh duck eggs for sale in the toilet, so we bought a couple of those for breakfast, before heading away from the lonely beach of Strandkirkja and continuing the long paved ride into Selfoss where we wanted to catch a bus in to þórsmörk and start our journey into the interior of Iceland. Choice bro! Love the puffins! Fantastic trip, with great photos -very envious. We missed seeing puffins by one week :( Hadn't expected to see so much greenery.